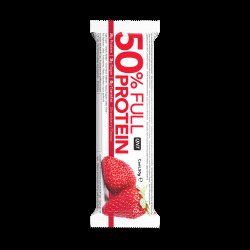 Fortified with whey protein, every serving contains 30g of high quality and bio-available protein. This protein contributes to muscle maintenance. Delicious Protein Shake presents a smooth flavour and contains zero added sugar. It also contains less than 1g of fat per 330 ml. INGREDIENTS: whey permeate, water, proteins 10% (milk protein concentrate & whey protein concentrate), thickeners: E460, E466 & E407, flavouring, stabilizer: E452, sweeteners: E952, E950 & E954, color: E101.